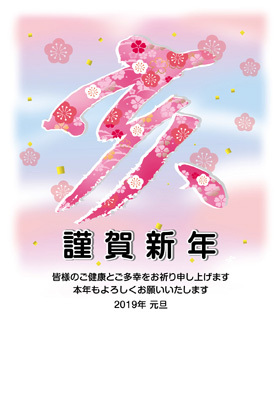 Japan's next era name is “Reiwa(令和)”, the government announced on Monday. The Japanese era name "Heisei(平成)" is scheduled to end on 30 April 2019 when Japan's Emperor Akihito will abdicate. He will relinquish the throne to his eldest son, Crown Prince Naruhito. 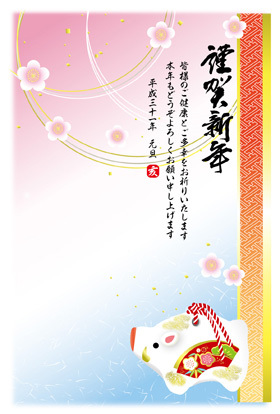 The new imperial era will begin on May 1. Japanese era name called gengo used to be changed repeatedly for various reasons including new emperors' enthronement, natural catastrophes, plague outbreaks prior to the Meiji period. It was established by law to change era names only when a new emperor acceded to the throne in 1868. The legal basis of the Japanese era system is lost in 1947 when the former Imperial Household Law was abolished. An era-name bill was passed, and legislation on the era name system was enacted into law in 1979. 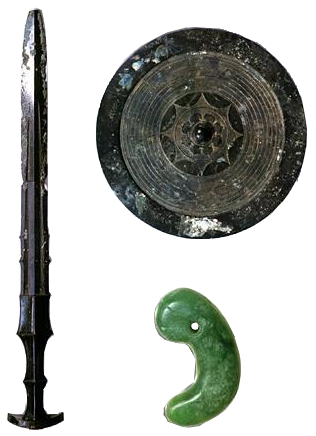 The era names started with Taika(大化, 645-650). From Taika to Heisei(current era name), 247 era names were used. The kanji "令" is not included in the previous 247 era names. The kanji "和" is included in 20 era names such as Wado(和銅, 708-715), Jowa(承和, 834-848), Genna(元和, 1615-1624), Meiwa(明和, 1764-1772), Showa(昭和, 1926-1989). All era names other than Reiwa are derived from Chinese classics. Reiwa comes from a preface to a ume(plum) poem in "Manyo-shu(Collection of Ten Thousand Leaves)", the oldest existing collection of Japanese poetry in the late eighth century. Early spring(February), it's good month to begin everything, the air is clean, the wind is calm. 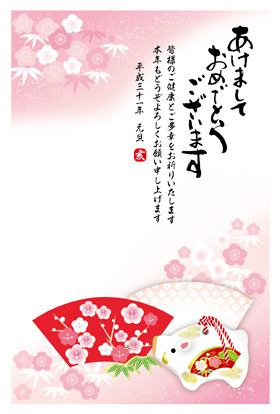 Ume blossoms come into bloom like a beauty who is putting on face-powder before a mirror. Sweet herbs(or a party space?) emit scents as if traces of a scented sachet emanate. Its author is unknown, but the poem is said to have been written on the 13th day of the 1st month in 730 when a ume viewing party was held at Otomo no Tabito's home. The collection of poems includes approximately 4,500 poems written by people from every walk of life from different regions of Japan over a period of about 300 years. Its poets consist of a variety of persons such as emperors, aristocrats, commoners, people at the very end of the road, front-line soldiers, punished or executed persons and beggars. May the New Year bring many good things to you. 2019 is the Year of the Pig according to the Chinese zodiac. 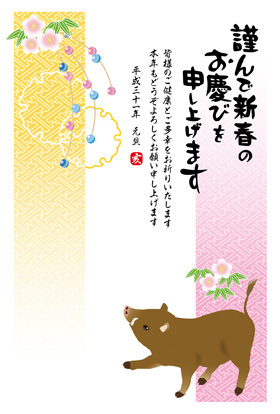 Each of the 12 Chinese zodiac signs is related to a characteristic animal. 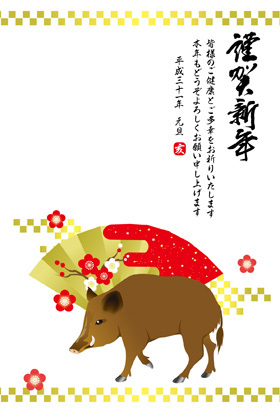 In the Japanese zodiac, the Pig is replaced by the boar because pigs were not common in Japan. 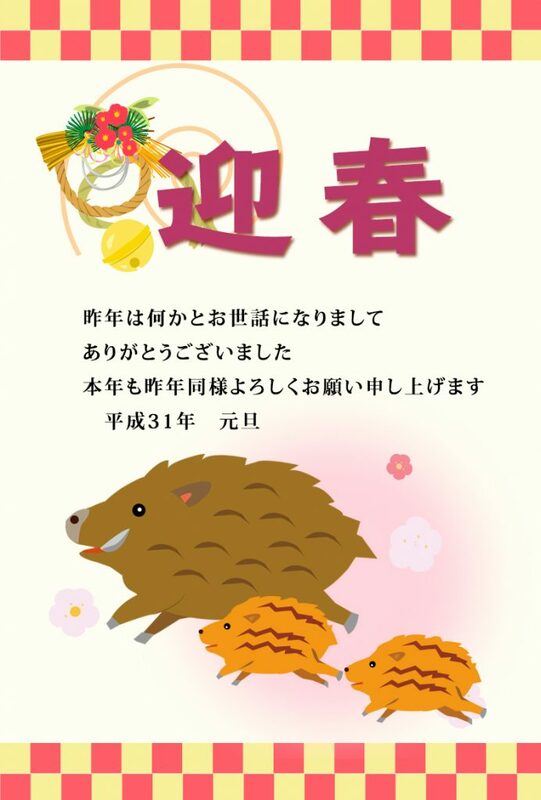 Wild boar was thought to be a messenger of the god of fire prevention. People used to put heaters in rooms to pray for fire prevention on the day of the boar. A pig-shaped burner for mosquito coil(蚊取り線香) is popular, but the burner is said to be boar-shaped to pray for fire prevention originally. 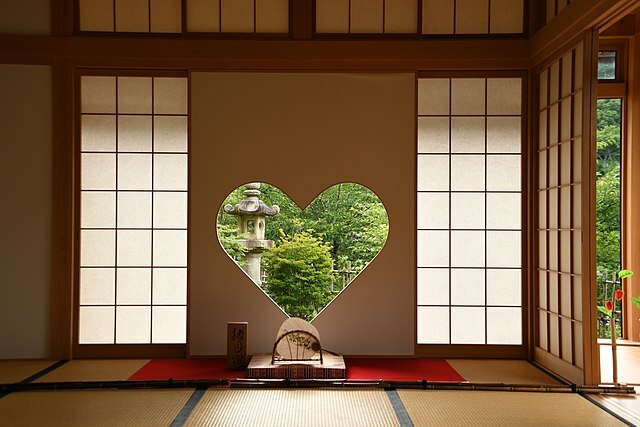 Visitors can sometimes see ornamental metal fittings with heart shaped cut outs in Japanese Shinto shrines and Buddhist temples. The cut outs mean Inome(猪の目, boar's eye) and have been used to ward off evil spirits and bring happiness. 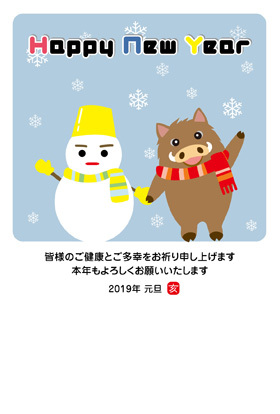 "元旦" means New Year's Day morning. 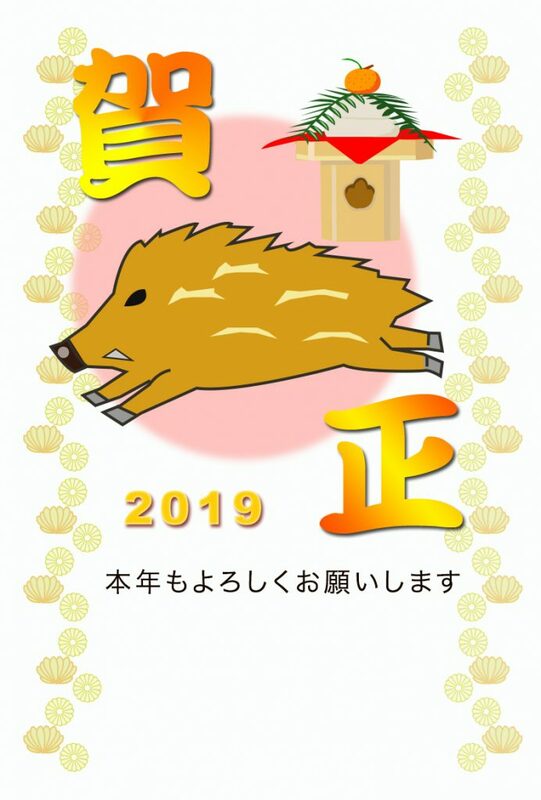 The Japanese era name "Heisei(平成)" is scheduled to end on 30 April 2019 when Japan's Emperor Akihito will abdicate. He will relinquish the throne to his eldest son, Crown Prince Naruhito. Japanese era names used to be changed repeatedly prior to the Meiji period. It was ruled to change era names only when a new emperor acceded to the throne in 1868. The next era name is in the air. The government will release the name a month before the imperial succession. "春" means spring. 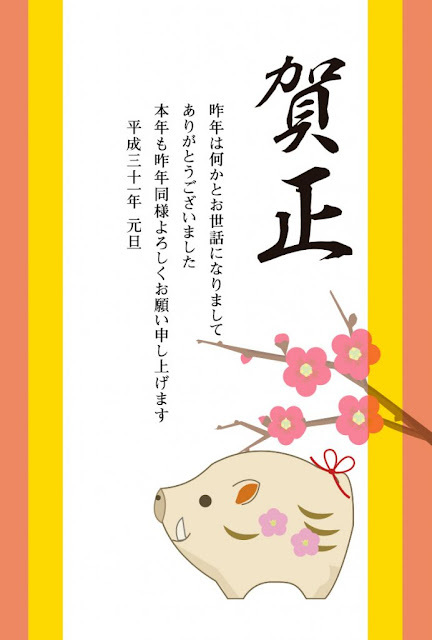 Spring means a new year because a year used to begin around the first day of spring according to the lunar calendar. Ornamental cabbages(葉牡丹, habotan) have been used as a ground cover plant of New Year's decorations since the middle of the Edo Period. 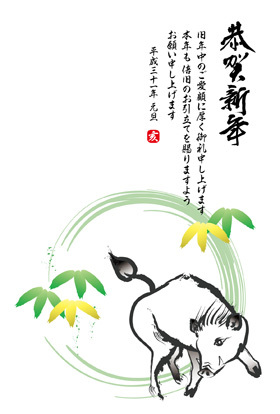 Habotan means leaves like a peony. In recent years, miniature ornamental cabbages are very popular as a cut flower or a plant suited to group plantings. A bouquet made of the cabbages looks like a rose bouquet. Ornamental cabbages are often planted with violas and garden cyclamens. Ready-made traditional New Year foods called Osechi Ryori are set in three-tiered boxes.